Jimbaran was one of the first places we set foot in Bali three years ago. We made it to the beach for sunset and sat at a candle lit table with the waves just about washing under our table. 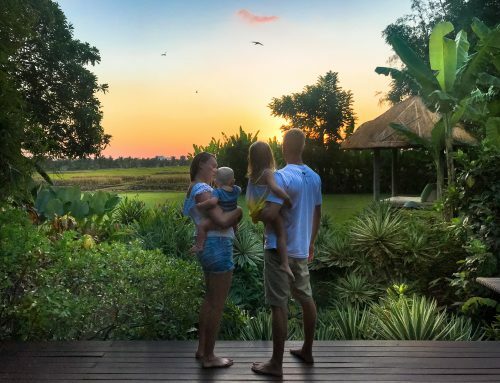 Our little one was only ten months at the time, and it was there our love affair with Bali began. The incredible sunset and ambiance on the beach, it was a hook, line and sinker situation. Jimbaran is so different from other West Coast Bali towns. Its far more quiet than places like Seminyak. There are plenty of people on the beach, but not even an eighth of the amount in comparison. Thats probably why we loved it a lot more. 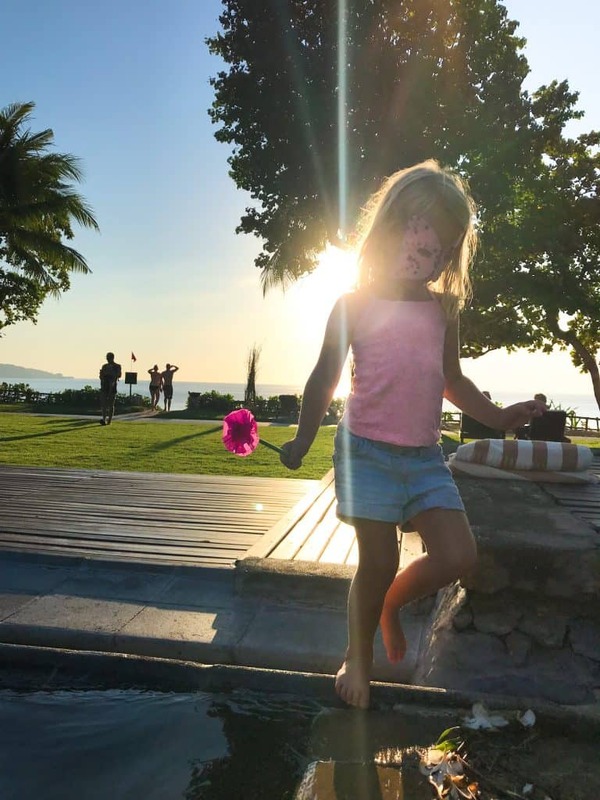 We were so pleased to return to Jimbaran with kids, now that our girl is a bit older. 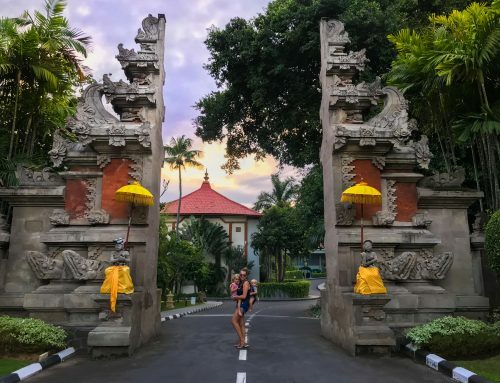 Being so close to the airport, Jimbaran is the ideal first, or last stop in Bali. Wether you have an early flight out, or maybe you are jet lagged after a long journey. You can literally role out of the airport and into a nice hotel or resort. 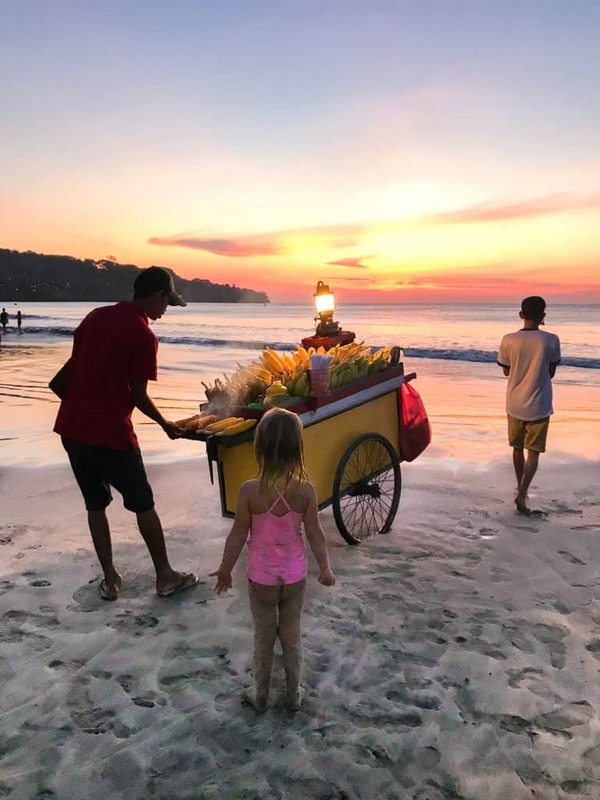 We loved the family friendliness of the area and I am pretty certain every time we come back to Bali, we will make a stop in Jimbaran. 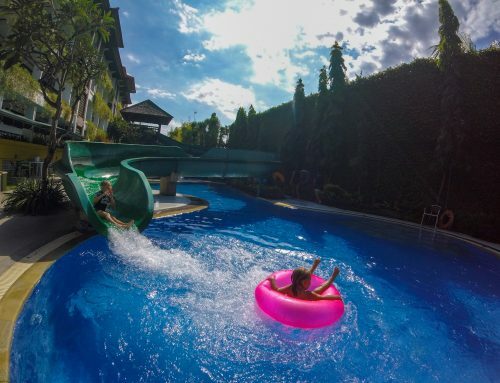 In our usual format, here is our play, sleep and eat guide to Jimbaran with kids. 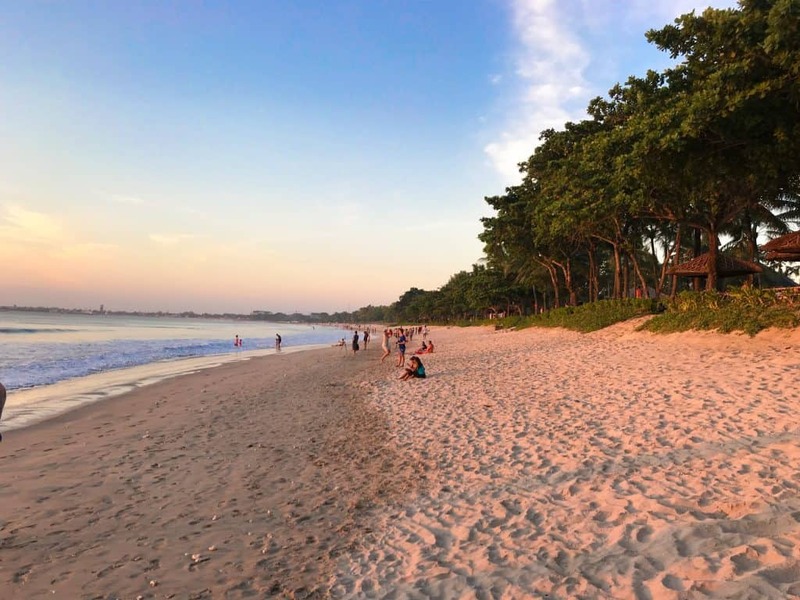 Jimbaran is all about the beach, surf and sunsets. The long bay wraps from the airport right around in an arc to The Sheraton 4kms away. The northerly part is a lot more rustic with beach shacks and the southerly part houses luxury resorts. The beach is mostly clean from what we could see, but I’ve heard it sees some trash washed in during rainy season. We loved our long walks, epic sunsets, lazing, surfing and body boarding. There is a really lovely surf school at the southerly part of the bay called J bay Surf and SUP. Its a little bit hidden unless you walk along the beach. In my opinion its in the best part of the beach for the kids. 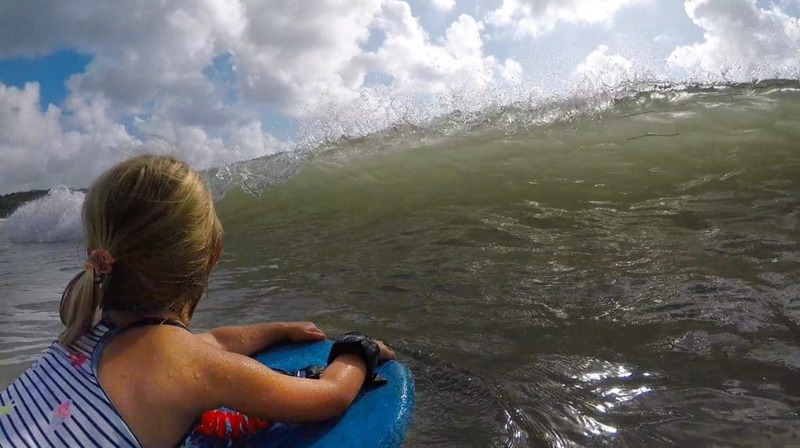 Esme loved trying out the body boarding and they have some really nice equipment. We find some shops, the equipment can be overused. Everything was new. Travel Mad Dad also rented a surf board and caught a few waves. Although the waves are a little smaller in that part of the beach, they were still fun. 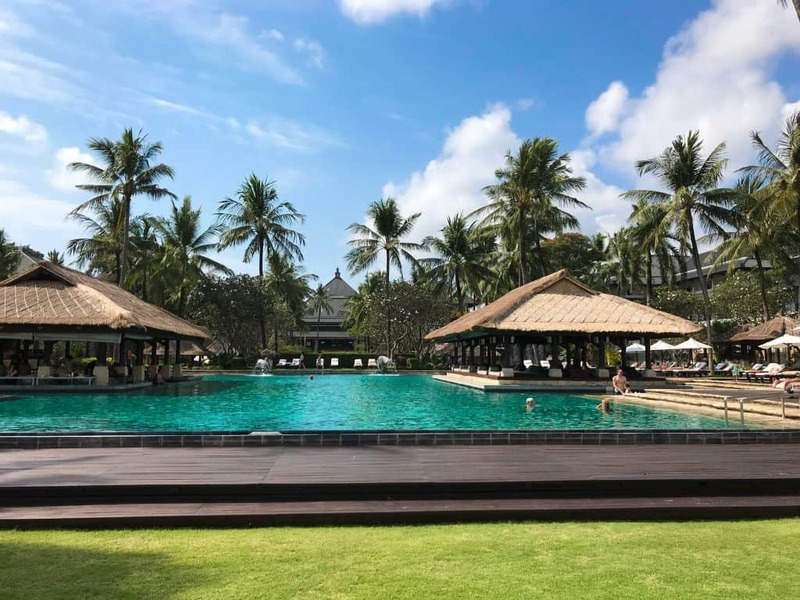 We stayed at the Intercontinental Bali Resort. Its based at the Southerly part of the bay and is literally beach front and a fantastic place for the family. 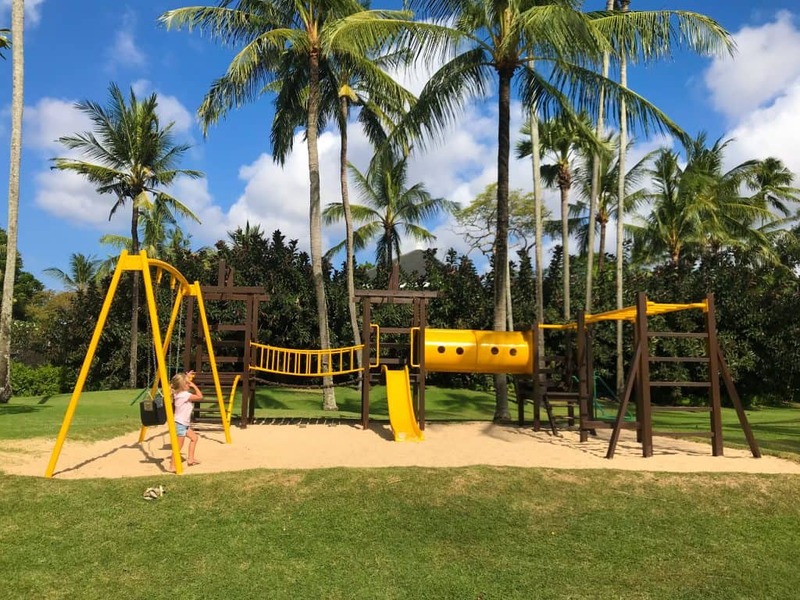 Complete with an extensive kids club, outdoor playground by the beach, several swimming pools, its probably one of the biggest resorts we have every stayed at. Lets talk about the kids club first. Planet Trekkers is a really nice and secure area with many staff. They have a craft station, plenty of toys and a chill out area with movies. They also have a shallow outdoor pool, a trampoline as well as a playground. Esme loved making masquerades with the staff, who I must admit are very hands on. She came back with all sorts of crafts like fancy crepe paper rose flowers. 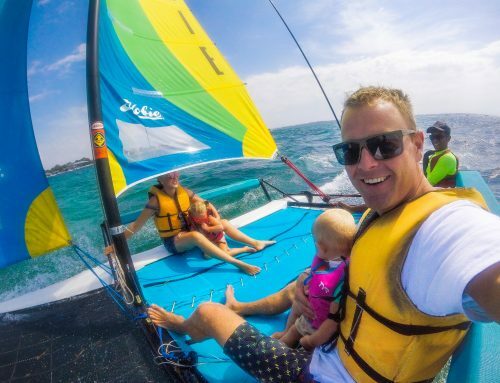 Children under four years old have to be accompanied by a parent or a nanny. Those over four can sign in and be cared for by the staff. They do have nannies available but they need some notice. It only costs 75k per child, per hour. Although you can also bring in a nanny from outside if you have your own one. We used the hotel one for a couple of hours one afternoon whilst we ran some errands and Travel Mad Dad went for a surf. The kids had a great time playing. Besides from the regular toys and so on, they have a weekly schedule of classes and activities going on. If you’ve been reading our content for a while, you will know we’ve been travelling for a long time and are obsessed with swimming pools. I have to admit Intercontinental Bali Resort has the best swimming pools. They are so much fun. Some have sprinklers, fish statues spurting water, whilst the main pool has a big box of toys for the kids to play with. There are views of the beach from the main pool. My favourite of all was the tall traditional statues in the pool. Literally picture perfect! Our baby had lots of fun crawling through the water fountains. Sunset Bar and Grill is another great spot for nibbles or drinks. It has a playground right next to it for little ones and live music in the evenings. Not to mention a min-gelato shop! 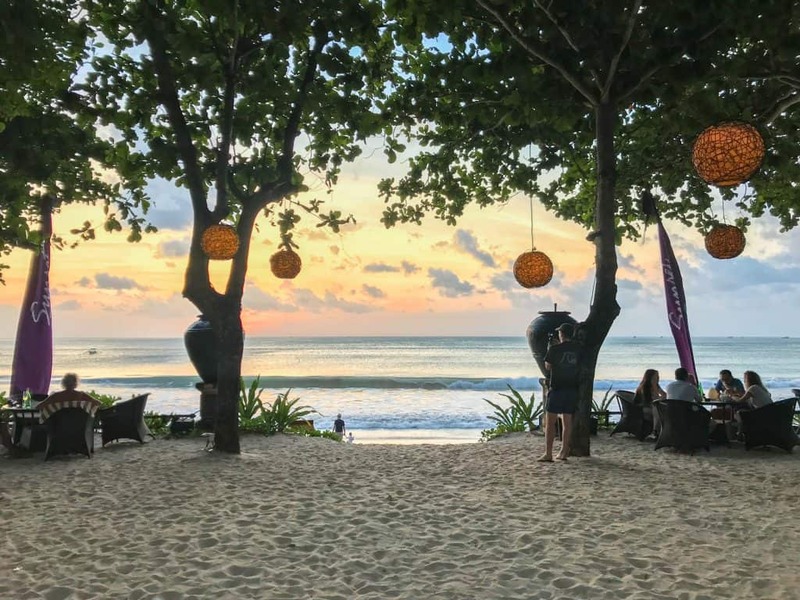 Its one of the nicest places for sunset, with the traditional wicker lampshades hanging from the tree and purple egg shaped lights all of the tables. They have an extensive kids menu and some really good seafood, burgers, wraps and so on. Joglo is inside the Jimbaran Resort. They have a really good menu thats not too overpriced. It was perfect for lunch. We had gado gado, pasta and the fresh fruit platter two days in a row. The food is tasty, fresh and nicely presented for a really good price. Oh and they do delivery which is perfect for tired little ones. 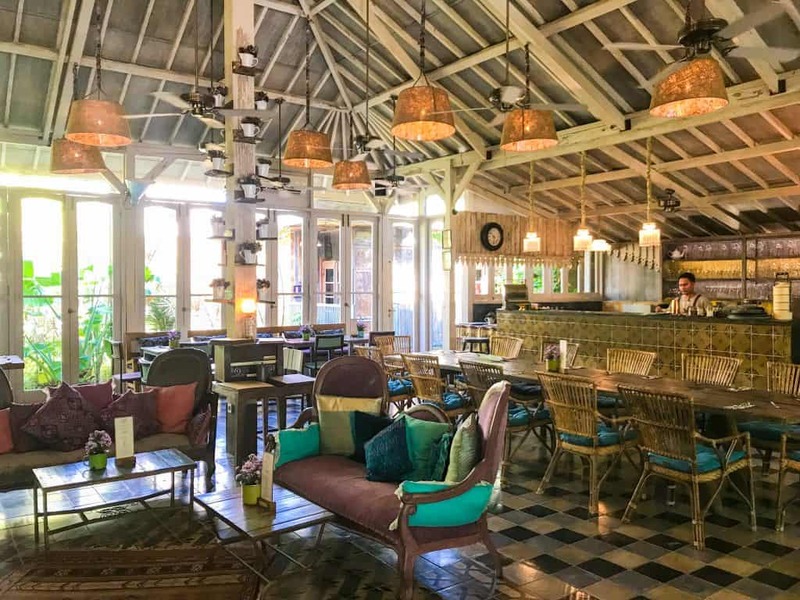 JWB is a beachfront restaurant at the Southerly part of Jimbaran beach. It looks quite basic in comparison to some of the other places, but the food is great, as is the location. Hubby brother lives in Jimbaran and he really rates it! They have lots of options. I had vegetarian curry and our kids had some fresh fruits and vegetable noodles. We had dinner there a couple of evenings whilst watching the sunset. The food is incredibly reasonable at only 20k per dish. Esme kept asking us for money so she could buy sweetcorn from the cart just in front of the restaurant. The corn is really good and serves as a good appetiser whilst waiting for dinner. They don’t have any highchair here from what I could see, so it might be worth bringing a travel one if you have it for any little ones. Balique is a really beautiful and chic restaurant just minutes from Intercontinental Resort Bali. It has lovely kids menu and of course all of the ingredients are super fresh and tasty. I had an open avocado sandwich, beautifully decorated with mung sprouts and salad. The food was great, albeit a little more on the price side for Bali, but still a lot cheaper than home. 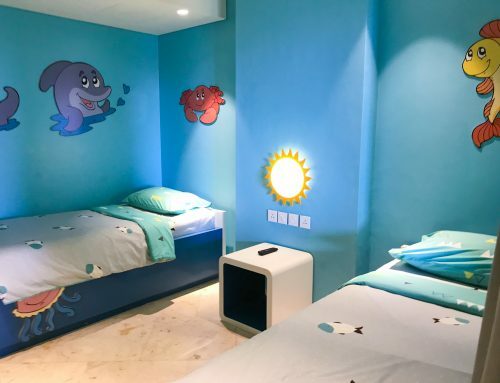 Have you found this review of Jimbaran with kids helpful? Leave a comment, we would love to hear from you. If we’ve helped you in some way, we would love if you could help us too. In this digital age there is a demand for immediate information online. Being a patron is a new-age way of giving a small token of appreciation for this information, which takes time to put together, with no financial return. We offer exclusive access to blog posts before they are published as a thank you. We also offer travel advice and consultancy at different payment tiers. You can sign up to our Patron program here. Jimbaran sounds like a very interesting place. The views are pretty awesome! hi, about the prices, which currency do you indicate? 75k / hour, I couldn’t really figure out. thank you!